Fresh off setting career highs in games played (80) and penalty minutes (211) with the Worcester Sharks in 2007-08, defenseman Brennan Evans agreed to a two-year contract with the Ducks on Friday. The Anaheim Ducks announced on Friday that they have signed defenseman Brennan Evans to a two-year contract. Per club policy, no financial terms of the deal were disclosed. Evans, 26 (1/16/82), played in 80 games last season with the Worcester Sharks, San Jose’s primary development affiliate in the American Hockey League (AHL). Evans scored 1-13=14 points for Worcester, setting career highs in games played and penalty minutes (211 PIM). 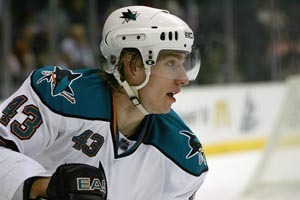 He was one of only two AHL Sharks to play in all 80 regular season games while also leading the team in PIM. Originally signed by Calgary as a free agent on Sept. 30, 2003, Evans appeared in two games during the Flames’ 2004 Western Conference Semifinal series against the Detroit Red Wings. He made his NHL Playoff debut in Calgary’s 3-2 win in Game 3 of the Western Conference Semifinals on Apr. 27, 2004 vs. Detroit. A native of Camrose, Alberta, Evans has played five seasons in the AHL between Lowell Lock (Calgary; 2003-05), Binghamton (Ottawa; 2005-06) and Worcester (2006-08). Since making his professional debut with Lowell Lock in 2003-04, Evans has scored 7-49=56 points with a +22 rating and 723 PIM in 340 career AHL games.